Art Basel is just around the corner, which means thousands will be flocking to Miami for one of the world’s coolest arts events. If you are one of these lucky people who finds themselves needing to get out of the galleries and onto the streets, then this guide is for you. Between art walks and openings, use your downtime to explore some of the city’s more offbeat cultural destinations. One of Miami’s must see landmarks (and most enduring mysteries!) is Edward Leedskalnin’s Coral Castle in Leisure City, FL. Often referred to as “Florida’s Stonehenge,” the Coral Castle is a compound comprised of megalithic multi-ton stones, sculptures, furniture, and a castle tower built of oolite limestone. 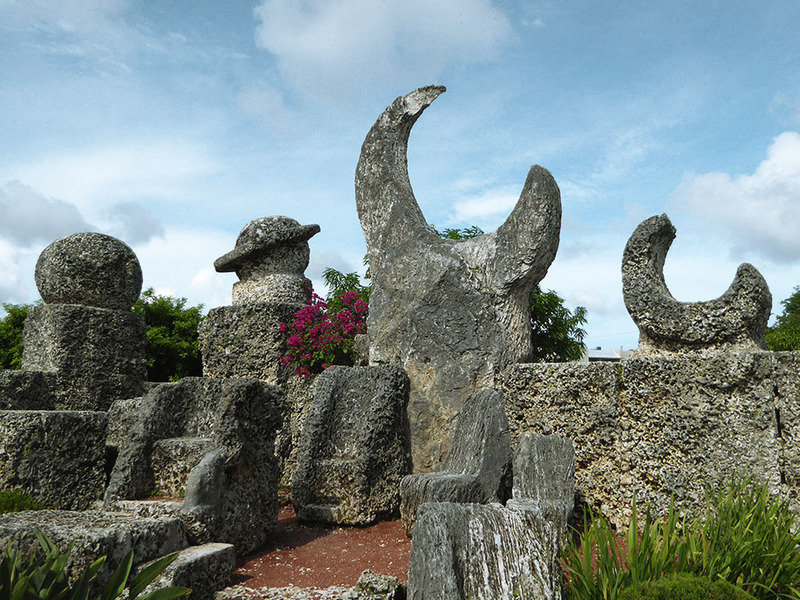 More than just a sculpture garden, the Coral Castle has been the subject of much conjecture and speculation surrounding the mysterious circumstances of its construction. The story goes that the eccentric Ed Leedskalnin built the compound singlehandedly after immigrating to Florida from his native Latvia in 1920, and continued working on it until his death in 1951. Leedskalnin was said to put great value in his privacy, and as such he did most of the construction work in secrecy under cover of night. Supposedly, no one ever witnessed him actually working with the titanic stones, neither quarrying, nor cutting or placing them. No mortar was used in the construction of the castle, and just like Stonehenge, all the stones are kept in place by their own massive weight. And yet, despite the apparent lack of assistance and modern construction tools, the stones, some of which weigh up to 30 tons, are cut and placed so perfectly that no light breaks through where they meet. This seemingly supernatural perfection has led to some wild theories as to how Leedskalnin was able to accomplish such a task. When asked how he did it, Leedskalnin would simply reply that he had unlocked the secrets of the Giza pyramids. These days, some observers say the construction could have been accomplished with competent knowledge of engineering principles, but others insist no one man could build such structures without some kind of assistance, perhaps even that of an otherworldly nature. Ever heard of a church that travelled 7,000 miles across an ocean? Well, you’re about to. The St. Bernard de Clairvaux Church is one of the oldest buildings in the western hemisphere, and the story of how it got to its current home is quite a fascinating tale. The monastery was originally built in the small village of Sacramenia, near Segovia in northern Spain, beginning in 1133 AD and taking 8 years to complete. It was originally christened “The Monastery of Our Lady, Queen of the Angels,” but was renamed in honor of Bernard of Clairvaux upon his canonization in 1174. St. Bernard was a respected religious leader and mystic from the Cistercian Order, and monks of his school maintained the monastery for nearly 700 years, until the land was seized and repurposed during the social revolutions of the 1830s. Fast-forward a century to 1925, when American newspaper mogul William Randolph Hearst purchased the monastery’s cloisters and outbuildings. He had the buildings dismantled piece by piece and meticulously numbered and packaged to be rebuilt in San Simeon, California. The approximately 11,000 crates of bricks, tiles, and sculptures made it to New York City before Hearst’s financial issues forced him abandon his plans to rebuild the monastery, and the massive collection of crates ended up sitting in a warehouse in Brooklyn for decades. 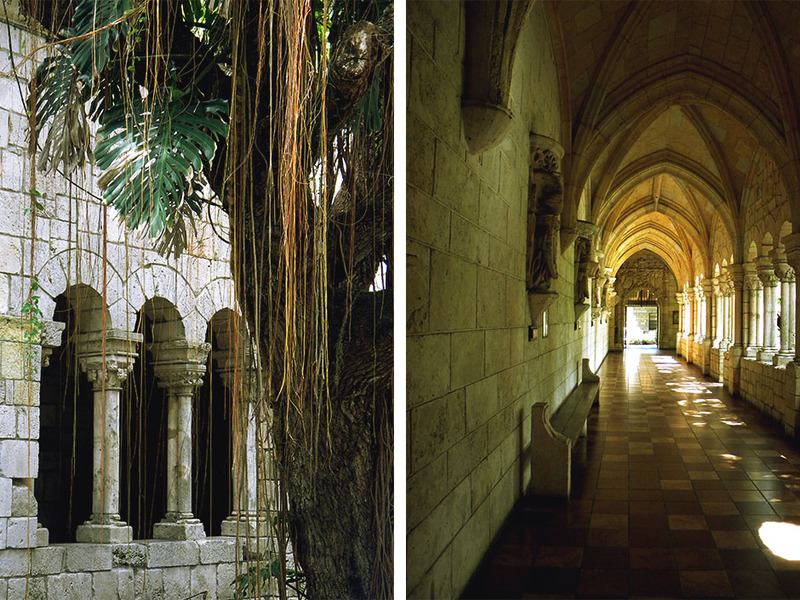 After Hearst’s death in 1952, two entrepreneurs bought the collection and brought it to northern Miami where the monastery was finally rebuilt and opened to the public as the Ancient Spanish Monastery. Today, visitors can walk around the cloisters and grounds of the monastery to experience the centuries of history, beautiful architecture, and spiritual significance of the place. Lovers of Hip-Hop culture best take note! Wynwood Walls is a self-styled “Museum of the Streets” in the Wynwood neighborhood of Miami. Conceived by the renowned community revitalizer, the late Tony Goldman, in 2009, Wynwood Walls is a community arts space built from the shell of a repurposed warehouse complex. While trying to find a new use for this abandoned warehouse space, Goldman realized that the many large, windowless walls would make perfect canvases for graffiti murals and street art, an artistic movement he felt was historically underappreciated by the arts community at large. Wynwood Walls quickly began to pick up recognition and momentum, with over a dozen American and international street artists represented on the site within the first year of operation. Today, Wynwood Walls is lauded as one of the successful projects of its kind, having helped to expose and legitimize street art to an audience that previously dismissed it. 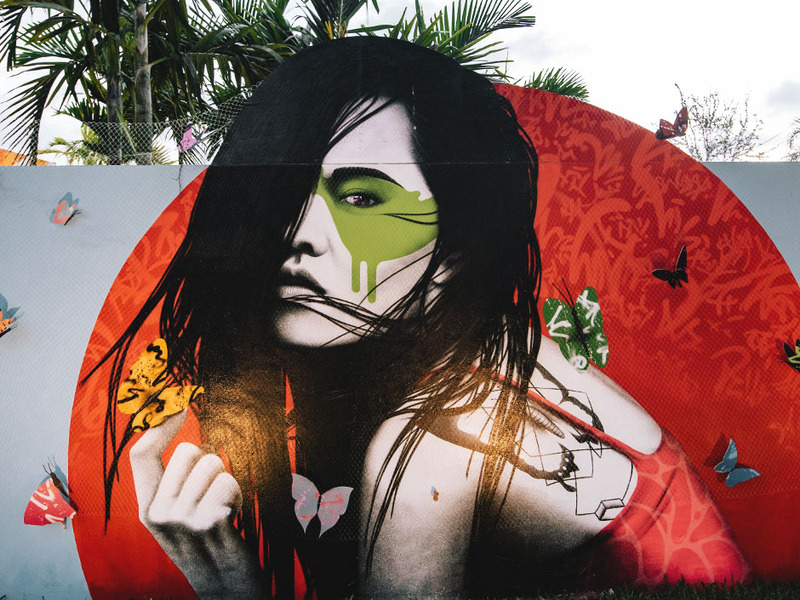 Wynwood Walls has since expanded to include a more traditional gallery space, restaurants, and events spaces, and has presented the work of over 50 artists from 16 different countries. It has become a major tourist destination, not just for lovers of hip-hop and street culture, but art lovers and travelers of all kinds, and has greatly increased the region’s pedestrian value. Wynwood Walls is easily one of the coolest cultural destinations Miami has to offer, and you’d be a fool to pass up the opportunity to see these incredible works of art for yourself. Flagler Memorial Island is a man-made island in the Biscayne Bay off of South Beach, Miami. It was dredged and built in the 1920s in honor of Henry M. Flagler, an American industrialist who played a major hand in the development of Florida’s Atlantic Coast. 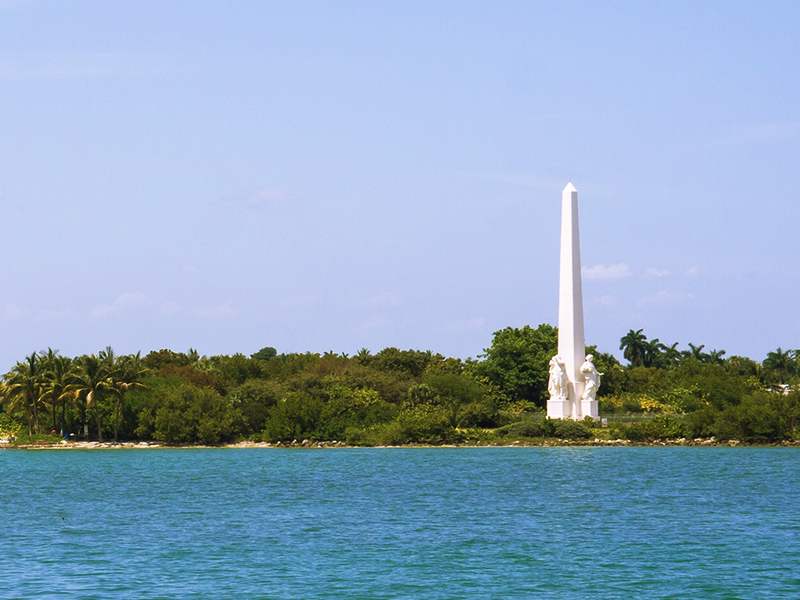 The monument was commissioned by Carl G. Fisher, co-founder of Miami Beach, who requested a circular island with an obelisk and four allegorical statues. If an obelisk on an artificial island doesn’t exactly get you salivating at the mouth, well, I can’t really blame you. But would it pique your interest if I told you the memorial was the site of a controversy of a certain—ahem—lascivious nature, in recent years? In 2011, pornographic production company Reality Kings came under fire for shooting one of their salacious films (titled Island Adventure, for those of you who want to do your own research) on the uninhabited island. Miami officials came down on Reality Kings, invoking a law prohibiting indecent exposure in public spaces. The production company claimed to have not broken the law there was no one on the island to witness such an exposure. Eventually, city officials won the argument by pointing out that Reality Kings never attempted to obtain the proper permits needed for filming such a project. So hey, if a memorial to a 19th century industrialist sounds boring, go to Flaggler Memorial Island to visit the site of the great Island Adventure controversy of 2011!